The venue for the Wikimania 2010 in Gdańsk encompasses the Polish Baltic Philharmonic and the adjacent Polish Maritime Museum situated on the small island of Ołowianka, linked with the rest of the city by two bridges and a small ferry. The Philharmonic, located in what used to be the local cogeneration plant, is one of Gdańsk's key cultural spots, but also the venue and would-be venue of events of worldwide prominence. 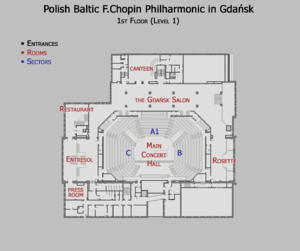 For instance, the city's bid for hosting the UEFA Euro 2012 group phase draw names the Philharmonic as the draw's venue. The most distinguished hitherto held event was the recent 25th anniversary of Lech Wałęsa being awarded the Nobel Peace Prize with the participation of other laureates: the 14th Dalai Lama, former South African President Frederik Willem de Klerk, Iranian human rights activist Shirin Ebadi, and Argentinian nonviolence advocate Adolfo Pérez Esquivel, as well as eminent European politicians, including French president Nicolas Sarkozy. Thus, despite its purely artistic name, the Polish Baltic Philharmonic is able to hold various types of conferences, which has been confirmed by the city's Mayor Paweł Adamowicz in an interview with Dziennik Bałtycki. A small conference room (20-25 seats) adjacent to the hotel's restaurant, two suites where interviews/press meetings for ca. 30 people can be held. The hotel has proved itself as a stable partner in co-organising large events, including the recent 25th anniversary of awarding the Nobel Peace Prize to Lech Wałęsa; apart from organising a banquet, the hotel provided the space for interviewing the Dalai Lama. Most of the area of the old City in Gdańsk is covered by a public free wifi with a many additional hot spots being provided in cafes, restaurants and shopping areas. Additional wifi infrastructure will need to be implemented by the Wikimania team. Ołowianka island will be supplied with a 100-megabit optic fibre connection, provided by TASK, Tricity's academic network operator. Currently the city authorities have covered much of the the Old Town with 2 Mb/s free wireless Internet access, hosted from 8am to 10pm during the high season. As of 2008 tourist season the western part of the Ołowianka island, where the conference will be held, was not yet in range of the wifi network. Securing broadband internet access for Wikimania 2010 conference attendees is no. 3 on our list of priorities. This page was last edited on 1 July 2010, at 04:52.